Photo's 01-03: In early February 1941, JG51 returned to the Channel Front. 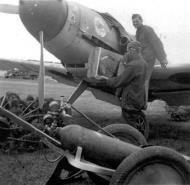 It was planned that the complete Geschwader should by then have been equipped with the Bf109F, but by that time only III. Gruppe had received a few examples. JG51's gradually converted to the 'Friedrich' during March and April, pilots of the Geschwader being sent back to Germany to collect their new machines. 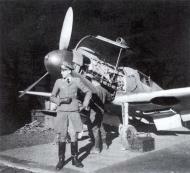 This unknown Oberleutnant of I./JG51 was photographed, with his new 'Friedrich' on the Channel Front, probably at Coquelles. Note that the Gruppe's 'Gemsbock', or 'Aiblingen Gams', emblem is still unfinished, only the blue and white background colours having been applied when these photographs were taken. Photo 01: The buzzard's head emblem of JG51 first appeared early in 1941 and was, therefore, still relatively new when this photograph was taken in June. Photo 01: A flight of Bf 109F-2s from JG51 in the Winter of 1941-42.